The upstairs verandah of the Broadway Museum offers a view of the full length of Broadway and the ability to see many locations of interest. The third Sunday of the month sees Mr.Brian Beasley conducting discussions of local historical interest such as this scene in the back courtyard of the museum exploring "Old Corner Stores". 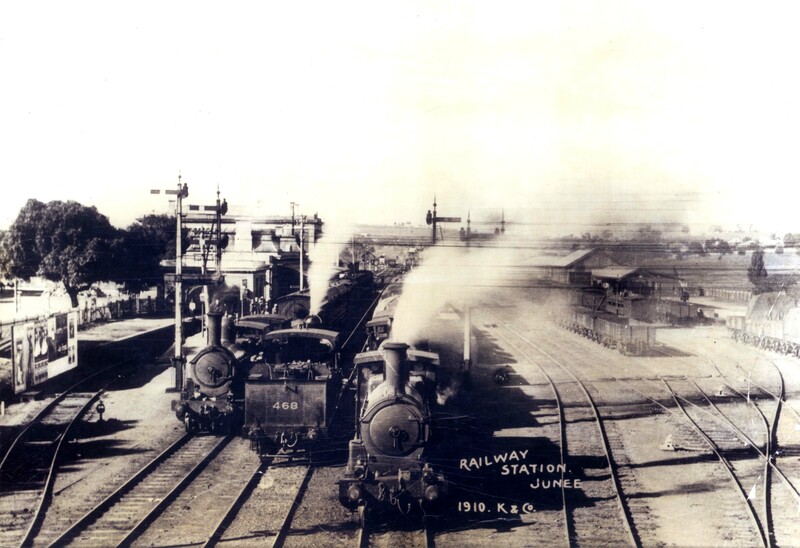 Beginning in 1878 Junee has been a "full on" hub of the Railways Industry. 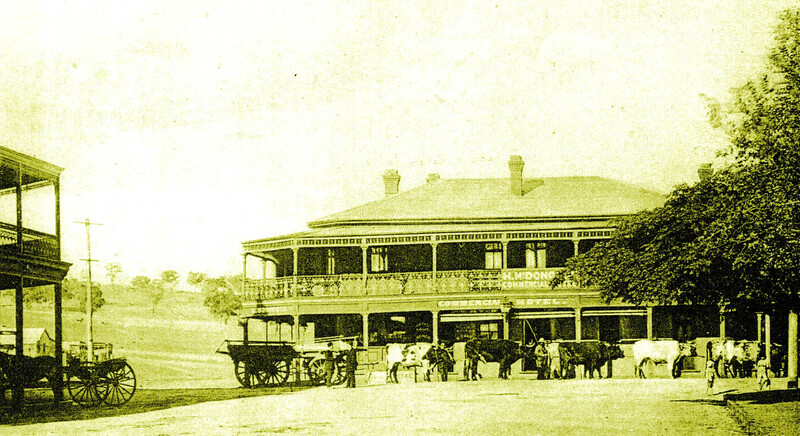 This Old photograph shows a bullock team in front of the "Commercial Hotel" in about 1890. Some streets in Junee are very wide to accommodate the turning of the teams -- hence the title of the main street "BROADWAY". NB:- "Broadway", NEVER, (on pain of death) Broadway street. For railways Buffs Junee holds many fascinations but for you, the casual traveller, the Junee regional area teems not only with present beauties and historical buildings, but the past evidences of a wild and wooly bushranger era, of gold and quite incidentally the emergence of the “Great Southern Railway”. Junee is situated almost exactly half way between Sydney and Melbourne at the junction of the Southwest line and in the northeast edge of the Riverina. Junee is not only an old railway town but also a centre of a ‘wealthy’ mixed farming region. So you can see after all that, the Broadway Museum should hold a very complex history. Housed in the old ‘Broadway Hotel’ (1914) on Broadway, the Museum is the showcase for “The Junee & District Historical Society Inc.” a group of several volunteers striving to preserve fragments of the region’s past both in artefacts, photographs etc — and we’ll chuck in the Bushrangers, Farmers and Golddiggers for good measure — plus the really interesting bits about the Railway. All this in a beautiful Heritage Listed 100 year old “Pub With no Beer” — but hang on there, the old BarRoom is home to “Betty’s on Broadway” a very appropriate Coffee Shoppe and BYO snack bar. We believe tarrying a while in the Junee Shire will open your eyes — and our volunteers are only too happy to assist you in achieveing this outcome. Other opening hours by appointment only. Closed Christmas Day and Good Friday.